All cargo on passenger aircraft must be security screened. The 9/11 Commission Act of 2007, required that by February 3rd, 2009, fifty percent of all cargo carried on passenger aircraft in the United States had to go through a security screening. Since October 2008, the Transportation Safety Administration (TSA) has required one hundred percent screening for all cargo carried on narrow-bodied passenger planes, which account for 95 percent of all flights in the US. By August 2010, the one hundred percent screening requirement will apply to all flights, including flights into the USA. The economic downturn meant that there were fewer cargo shipments, approximately 35 percent fewer, so achieving one hundred percent screening requirement by August 2010 is an attainable goal. However the downturn meant that fewer carriers were applying to become certified and the TSA is stressing that only cargo that is one hundred percent screened at the piece level will be allowed on passenger planes after August 1, 2010. To ensure the movement of cargo is not impaired, the TSA developed the Certified Cargo Screening Program (CCSP), a voluntary program designed to move some of the screening process to shippers, third-party logistics providers (3PLs), air forwarders, and independent screening services. Those companies that want to take part in this program can apply to operate Certified Cargo Screening Facilities (CCSFs). Cargo screened at a CCSF and then transported through a secure chain of custody will not need to be inspected at the airport, which means no delay in transportation to the customer. CCSP is being rolled out in a phased approach. The first phase was rolled out with a small group of logistics companies in number cities in 2008, including San Francisco, Chicago and Philadelphia. The TSA has approximately three hundred companies certified as a CCSF and are adding companies on a regular basis. However when a CCSF shipper moves it freight to a forwarder, it will have to use a company that has been certified by the TSA. 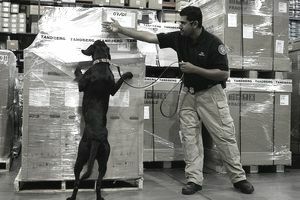 A key characteristic of the CCSP system is the rigorous tracking of the chain of custody, including the use of tamper-evident technology to assure that after the cargo has been screened, the cargo remains secured in transit to the aircraft. The airlines will continue to have ultimate responsibility for ensuring that cargo has been screened prior to flight. If the airline decides that they cannot verify that the cargo has been screened, the airline must screen it before allowing it to be transported. Certified Cargo Screening Facilities must adhere to a set of rules set by the TSA. For shippers that do not want to be become a certified screener, they can achieve pre-screening by using an independent cargo screening facility (ICSF). This is a facility that is owned by one company or several companies which are used by a number of shippers when there are no certified operators in the area. The TSA acknowledges that the screening the difficult, complex, skidded cargo still has to be overcome. Shipments on narrow body aircraft, that had to be screened by August 2008, are not skidded. Most wide-body aircraft does operate with skidded cargo. If the economy recovers before the August 2010 deadline, the screening capacity would need to significantly increase. If cargo increases back to 2007 levels, the capacity required to screen one hundred percent of cargo will have to increase by three hundred percent. If capacity does not increase, there is the distinct possibility of backlogs in screening and delays will occur across the supply chain. The TSA are concerned that if carriers wait until the final few months to become certified, prior to August 2010, they will not have the administrative resources to certify carriers in a timely fashion. This in turn will cause backlogs across the supply chain. Article updated by Gary Marion, Logistics and Supply Chain Expert. What Are Transportation Accessorial Fees? What Is a For-Hire Carrier? Supply Chain Management - How Do I Measure On-Time Delivery?